10 Stylish Maxi Dress Outfits + Link Up Yours! One of my favorite go-to looks for summer and into fall, are maxi dress outfits. There are so many ways to wear a maxi dress, from dressing it up to down by adding different layers and accessories. I’ve worn a maxi dress to a dressy summer get together, as a cover-up and as an everyday look. The options and ideas are endless! I’ve teamed up with nine of my fashion blogging friends to show you just how versatile a maxi dress can be. I love this maxi dress from Old Navy because of the pattern and the fact that it’s strapless. I’ve worn it as a bathing suit cover-up and it’s just perfect for that because it’s easy to slip on and off. But I also wanted to wear it out and about, but didn’t want to go strapless. The solution? Throwing the ever-so-versatile denim jacket over the ever-so-versatile maxi dress. I love this look because I feel a little more covered-up and I can make this outfit as dressy as I want by switching up my accessories and footwear. Speaking of accessories…can we just take a minute to say how incredibly cute these tassel earrings are?! They’re from Cents of Style and they have several color choices. I ordered the black/turquoise and the gold/tan ones. Would you like some more maxi dress outfit ideas? Take a look at the lovely ladies below. I love how they all styled this look! I love this dress on you, it is so flattering!!! 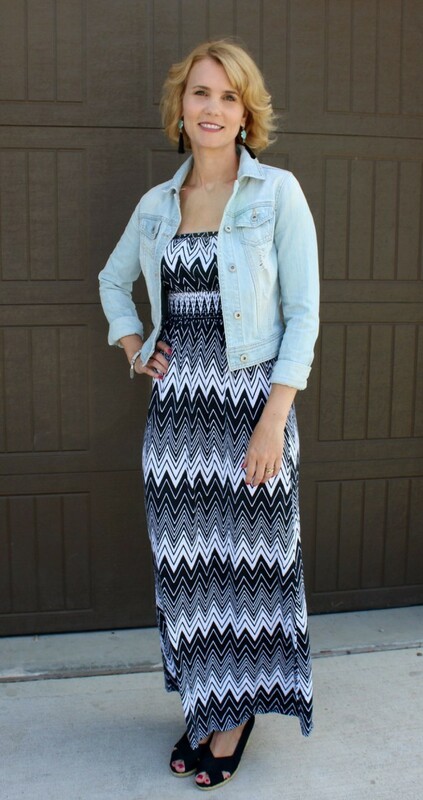 I add denim jackets to my maxi dresses too! You look gorgeous! I absolutely love the style of this dress. Always so classy and chic. First I LOVE that jacket. I want it!!! Thank you Andrea! I am loving these tassel earrings. So glad I purchased them! That denim jacket is too fab lady! I want!